Ospreys head coach Allen Clarke. Pic: Craig Thomas/Replay Images. 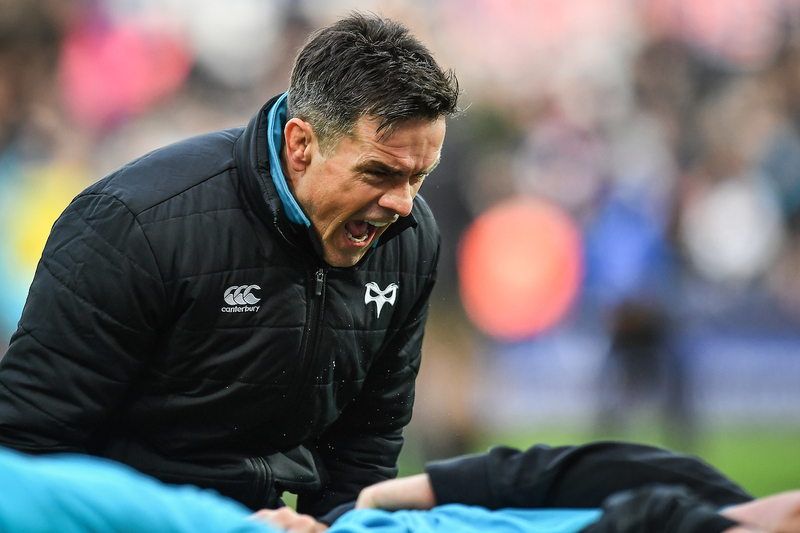 Allen Clarke believes his resurgent Ospreys have rediscovered their swagger as they get ready for a European showdown against the Cardiff Blues. The Judgment Day clash at the Principality Stadium on April 27 is the Ospreys’ final game of the regular season. It will certainly have something riding on it – either a route into next season’s Heineken European Cup directly, or through a play-off, and possibly a Guinness Pro 14 knockout spot, depending on other results. The Swansea region have put themselves back in the hunt for both competitions after their comprehensive 43-7 win over the Southern Kings in Port Elizabeth on Friday night. Head coach Clarke watched his team run in seven tries to claim a third successive bonus point victory that included a hat-trick of tries for full-back Dan Evans. Loved by Ospreys fans, rejected and ignored by Wales, Evans has become the first Ospreys player to score three hat-tricks in his time with the region. “The boys will now have a few days off and then we’ll come in and really focus on that game against the Blues,” said Clarke. “It means that last game is now going to matter. To get to that stage, after everything we have been through, it’s fantastic for us as a club. “It’s a testament to everybody – particularly the players. There is a lot of confidence now flowing through this side again and the boys are enjoying their rugby. “We were brilliant in the first half. They came at us hard, and we rode that, were patient and took our opportunities brilliantly. “Dan Evans got three tries and has now become the first Osprey to ever score three hat-tricks. Bradley Davies also scored two tries. I think it’s the first time for a while he’s done that. The Ospreys’ win over Conference B whipping boys the Kings moved Clarke’s men above the Blues and into fourth place in the table. The Ospreys are two points behind third-placed Connacht and two ahead of the Blues. If the Blues were to win at Connacht today, the Ospreys would stay in the hunt for the Pro14 play-offs. If the Blues managed the victory the Ospreys would go through to the Pro14 quarter-finals if they beat the Blues on Judgement Day and Connacht were to lose their last game at Munster. Bonus points could result in a tie but the Ospreys would finish ahead of both their rivals because they would have more wins. If Connacht get the job done in their last two fixtures and keep ahead of the two chasing Welsh regions, then the all-Welsh end-of-season battle will decide which team enters the play-off game – against the fourth-placed team in the other conference – to decide Heineken Cup participation next season. Full-back Evans was up and running as early as the 13th minute, adding further scores in the 17th and 56th minutes. Bradley Davies also contributed a brace, one either side of the break in a clash which was over by the 20-minute mark. Cory Allen also went over, with Hanno Dirksen adding another in the 25th minute.